Inmount bases on the cutting-edge of home&kitchen product. Pursuing the best quality of Adjustable Desktop category and devoting to providing the best product and service to customers. We make every effort to achieve the best in every detail of design, material, sales and aftermarket. if you have any question about our product just pls contact us feel free, we will take reply within 24 hours. Unique Vintage metal wine rack. Perfect for wine show your favorite wine. 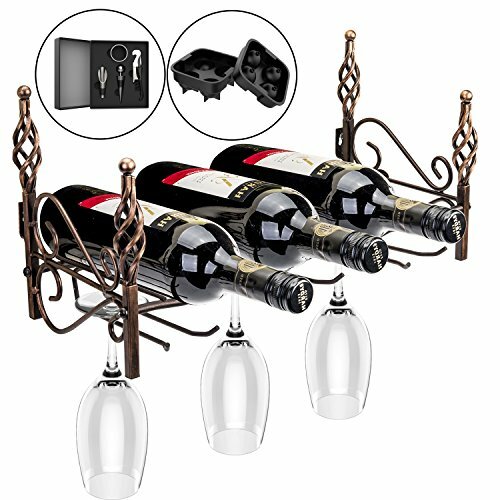 Inmount retro vintage european modern style wine rack,noble and elegant metal wall mount wine holder.decor your home and storage your your favorite wine. Wall mount rack size: 7.5x8.6x16 inch.easy to 4 wine and holder 6 stem glass.saving space and storage your wine and stemware.other accessory in one gift box. Material: rack made of high quality matel and hand-painted oil rubbed bronze color,non-colorfast and rust resistant.corkscrew made of high quality stainless steel. Easy to installation,all the accessory include,you can installa the wall mount in few minutes. If you have any questions about this product by Inmount, contact us by completing and submitting the form below. If you are looking for a specif part number, please include it with your message.